First I just want to say that for some garden planters, pot feet are essential for the health and well being of your plants. Even containers that have sufficient drainage holes, can benefit from pot feet. Problems can arise if your planters sit directly on a non-porous surface, like a deck or patio. The holes can get plugged up and then the water can't get out of the holes, which can drown your plants. Pot feet can solve this problem by elevating your planters. That way the holes are unobstructed and water can flow through. 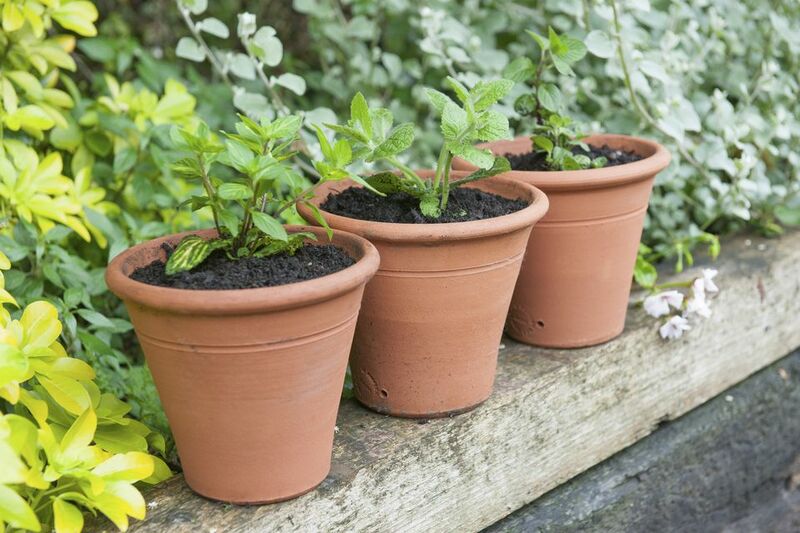 Some other advantages to elevating your garden pots is that more air can get to your plants' roots through the drainage holes, which is good for the health of the roots. Another big advantage to elevating your containers is that you protect your deck or patio from rots and stains by not having soggy pot sitting directly on it. Now on to the primary beauty of Potrisers - they disappear. Designed by a professional container gardener, who didn't want decorative pot feet, these small squares of non-marking rubber go underneath your pots, raising them just enough to be effective without changing the look of your pot. With Potrisers, your pot looks like it is slightly floating. Although a bit pricey, these tough little squares are practically indestructible and should last indefinitely. Made of 100% recycled material (truck tires), four of the smaller sized Potrisers will hold up to 1600 pounds. Four of the larger size Potrisers will hold 12,000 pounds - which would be one big container garden. Potrisers are not only great for garden planters, they work well for houseplants too. Put them under plant trays or pot saucers to save your surfaces from water rings and lingering moisture. I even know someone who uses them to elevate a sound system, and my laptop, which gets ridiculously hot, is sitting on four of them right now.